Posted April 3, 2017, in Featured News, News. Andrew Carnegie once said, “Teamwork is the ability to work together toward a common vision. The ability to direct individual accomplishments toward organizational objectives. It is the fuel that allows common people to attain uncommon results.” At Rutgers University–Camden, working together is key to having a successful and satisfying student life on campus. Within the Department of Fine Arts, the Art Students’ League (ASL) strives to bring art appreciation and opportunities to the Rutgers–Camden community and surrounding areas. Since its establishment in the early 1980s, ASL has been one of the most popular student-run clubs on the campus. Ken Hohing, an alumnus of Rutgers–Camden and current head of the photography concentration, was a member and president of the club when he was a student. “Members were always active on campus doing things such as displaying and selling their artwork during tabling, helping theater majors design stage sets, and creating chalk drawings on the sidewalks,” he recalls. In its early days, ASL predominately served art majors. It provided a support group to artists during their academic career, enabling them to create meaningful relationships. ASL also provided opportunities for art students to become exposed to different mediums of art and apply their skills outside of their academic work. “In general, we were a big social group of diverse art majors. It didn’t matter if you were a fine artist, a digital artist, an art history major, or sculptor. We all came together to help one another and learned while doing so,” Professor Hohing says. Members of the Art Students’ League often hold bake sales and other fundraisers in order to support their programming, such as trips to area museums. ASL continues to involve all art students and partakes in their traditional activities: soliciting original art work from students to publish in their free Matter magazine, which can be included in students’ portfolios; visiting museums in New York City and Washington D.C.; attending Philly’s art crawl every First Friday; and holding bake sales and promotion tables. Tiana McMillan, a sculptor and ASL’s Media Publicist, loves the learning experiences she receives being part of the club. “I always attend ASL’s semester trips to New York and D.C. and I am always amazed how I can connect what I learn in class to the sights I experience during these trips. I think what makes my time better is that I can invite an outside member and see their raw reactions,” she says. 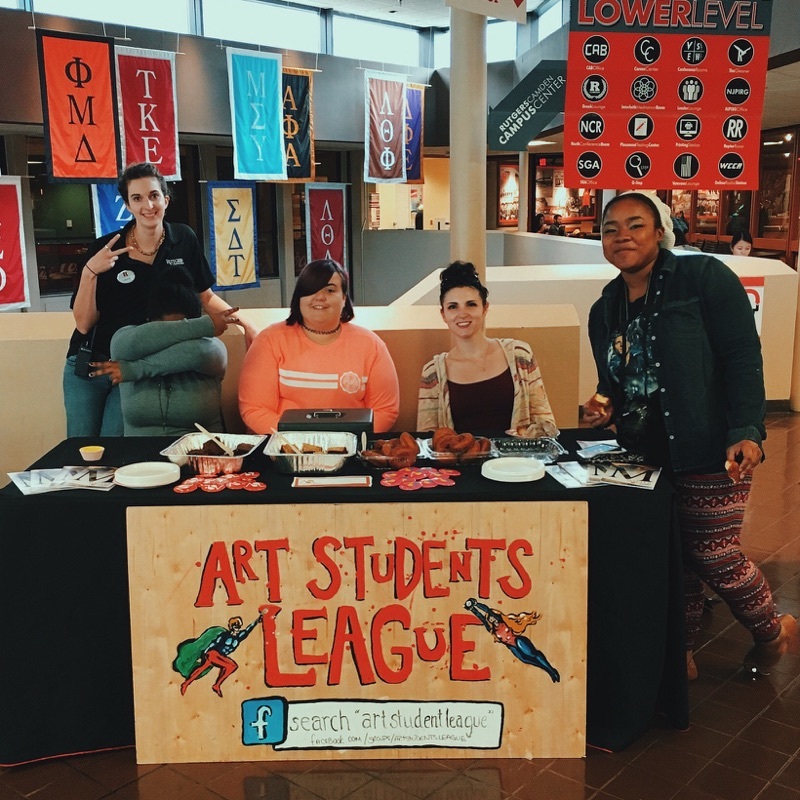 In the past couple of years, ASL has become more inclusive by focusing on attracting non-art students to become members and get involved in their activities. One way they are doing his is by providing their artistic services to different organizations and departments across the Rutgers–Camden campus through collaborations. Some of their responsibilities have involved face painting, creating props, and providing volunteers to help with setting up events. Their involvement never goes unnoticed and they have been approached by other clubs to collaborate on projects that sometimes bring together diverse disciplines and highlights social issues. One of ASL’s successful collaborations have been with Camden Comic Con (CCC), run by Miranda Powell, an alumna of Rutgers–Camden and the Arts Education and Community Arts Program Assistant for the Rutgers–Camden Center for the Arts (RCCA). “What keeps me motivated to continue Camden Comic Con is seeing how it empowers youth,” Miranda says. “During the first year of Comic Con, a student I taught art to in the city of Camden had a forty page comic book he wrote and illustrated himself. He took the initiative to visit different comic book artists and writers and show them his work. They congratulated him and gave him critiques. He was in fourth grade at the time,” she concludes. Page last updated by Faculty of Arts and Sciences at 11:46 am October 25, 2017 . This page was printed from http://fas.camden.rutgers.edu/2017/04/03/we-r-arts-and-sciences-art-students-league/ at 5:29 PM Saturday, April 20, 2019.